There’s a collective sigh of vindication on Garrison Circle in San Jose after residents there learned the city was dismissing questionable citations and fines for illegal fireworks. “It’s awesome,” said resident Kelsey Doetsch. Residents of the small street exposed a large flaw in the city of San Jose’s new fireworks enforcement. On Thursday, the city relented and announced that it will dismiss all 45 fireworks fines it issued last month. Several fines were sent to homes on Garrison Circle and other parts of San Jose without a single visit from law enforcement. No police officers. No firefighters. No code enforcement officers. "None at all,” Garrison resident Sally Phan said. The $500-plus citations came about when the city invited people to report illegal fireworks using an online form. NBC Bay Area found that those accusations rarely had video or photo evidence, sometimes included just one word, and in several cases didn’t even cite a specific address. Yet, the fire marshal still issued dozens of citations. NBC Bay Area Responds challenged the city, as did the residents of Garrison Circle. On Thursday, city leaders conceded mistakes were made and the fines are unjust. “We all apologize for anyone who was issued a citation unfairly,” said San Jose Assistant City Manager Dave Sykes. “There’s obviously room for improvement, so obviously, that’s why we decided to dismiss these citations," Sykes said. The unfairness wasn’t always so obvious to the city. “This has been going on for a month,” Doetsch said. Garrison Circle residents said City Hall initially denied their contention that the system had flaws. So, Guzules led the charge to keep the pressure on. The Garrison group talked to NBC Bay Area three weeks ago; they met with their council member last Saturday; and Guzules on Tuesday confronted the City Council about the unfounded accusation against her. “I did no such thing,” she told the council. Guzules reflected on the frustrating journey Thursday. “If we hadn’t made a big raucous, I’d be writing a check tomorrow,” she said. Guzules is happy she spoke up. And even happier someone listened. The city says it’s now going to “review” its policy for issuing fines. 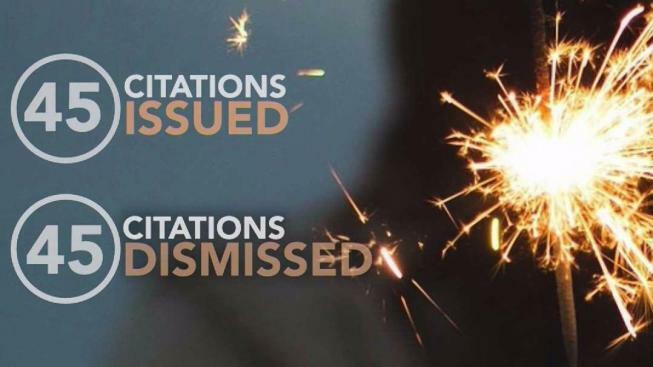 It’s also set to re-examine the appeals process, because, as of now, you can only contest a fireworks citation if you pay the $500 fine first.